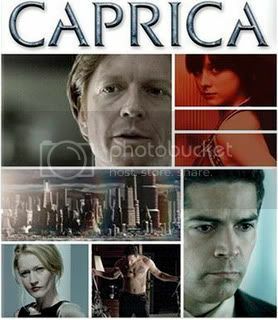 Caprica DVD Cover. Copyright 2009, SciFi Channel. Airs on SciFi Channel starting early 2010. DVD including an extended version of the pilot, bonus scenes, interviews, and video blogs was released April 21, 2009. Set fifty-eight years before the Cylon genocide attacks and the subsequent events of Battlestar Galactica, Caprica details the genesis of the first Cylons amidst the backdrop of two rival families—the Adamas and the Graystones. For those bereft fans tuning into Caprica as a means to replicate the magic of Battlestar Galactica, you will be sorely disappointed. Oh, sure, there’s Cylons, and Adamas, and pyramid ball and plenty of ‘frak’s flying left and right. But as the pilot streamed with a bang onto the enormous screen of Hollywood’s ArcLight Cinema Dome, I was reminded in a not unpleasant way that this was not going to be the same show. And oh what a bang it was! ramifications. Because as it turns out, Zoe is the daughter of surgeon Amanda Graystone and brilliant scientist Daniel Graystone, who has been consulting for a company entrusted with building the perfect government war machine. We recognize the faulty prototype as an early-model Centurion Cylon. Bereft with grief over the loss of his daughter, Daniel forms an unlikely bond with earnest, honorable young lawyer Joe Adams, who also lost his wife and child in the explosion. In the search for answers, Daniel discovers Zoe was a chip off the old block. Using a hollaband, a computerized headband, that teleports him to the virtual nightclub where Zoe’s twin resides, he reunites with his dead daughter. The virtual twin from the virtual nightclub was not a twin at all, but an engineered digital life copy into whom Zoe downloaded her DNA and personality, the Zoe-A. Preying on Joe’s grief and guilt over losing his family, Daniel poses the tantalizing possibility of being with them again through artificial computerized human replication. In setting up the major moral and philosophical conflict of the show, Daniel cajoles Joe into stealing the missing component for the war machine robot—a ‘metacognitive processor’, an artificial brain—from the rival Virgis Corporation from his own native Tauron. Adams’s reunion, however, is not nearly as heartfelt as his daughter’s replicon, trapped in a soulless black nothingness, is frightened by her very being. Buoyed by this realization, Adams reclaims his responsibility to embracing the living, namely his young son William, in a deliciously cheeky early peek at the eventual Galactica Admiral. He recounts for his son their family’s cultural and ethnic lineage from Tauron, where vicious civil wars left them orphaned strangers in a strange land. “Our name is not Adams,” he tells his son. “It’s Adama.” Nevertheless, it is too late to stop Graystone. As the Centurions flashing LED eyes change from orange to red, a Cylon—a cybernetic life node—is born, but at what cost, and at what consequence? Caprica’s departure from the BSG shadow is immortalized in more than plot and core conflict (to build or not to build artificial intelligence), but in a cinematic majesty and geek-chick technological marvels that make for some visually appealing television. The gadgets of Caprica are bright, sleek, modern, oozing with cool, in direct contrast to the simple, practical, dilapidated equipment of the aging Galactica ship. Hollabands, paper-thin computing sheets with lit-up displays, cyber-chamberlains reminiscent of Rosie the Maid from the Jetsons, virtual mental computing, streamlined transportation hubs that we can only dream about. The cinematography of the show is split between rich, vibrant oranges and yellows for outdoor scenes and fresh blue-green hues for indoor scenes. Caprica also take advantage of Vancouver’s glorious outdoor settings in a way Battlestar could not within the location limitations of … er … space. Another critical divergence for Caprica will be its serialized storytelling and focus on the linear dramatic development of Cylon creation and the ethical and moral quandaries posed therein. “It’s more about their personal lives,” series producer/writer Jane Espenson remarks. “They don’t have the threat of death breaking down their neck every moment so that you can feel more lived in, you can explore this culture more.” Adds Ronald D. Moore, “It’s a different show. I mean, losing the action-adventure is a risk…. [But] since there’s no Cylons coming in to sort of destroy the Galactica every once in a while, fate and humanity doesn’t hang in the balance yet.” Instead of the salvation of humanity, Caprica will probe on the very essence of what it is. “Find those things that make you cry, that make you feel,” Joseph Adama pleads of Daniel Graystone. “That’s what makes you human.” The Adama/Graystone schism certainly forms the show’s psychological nucleus, but other important questions are also raised: the roots of the monotheistic vs. polytheistic religious conflict, the greediness of the very corporate vultures that ordered the beta Centurion war models, racial and ethnic strife between the Twelve Colonies unified under one government, and the very limits of artificial intelligence and the human essence. “[These complex and difficult themes] are to Caprica what the space battles were to Battlestar,” remarks producer David Eick. Ultimately, it is difficult for any show to escape the looming shadow of such an accomplished and critically acclaimed predecessor, especially when their plots are indelibly linked. Thankfully, Caprica has decided to step out of that inimitable shadow, contextually and stylistically, to create its own identity, and some pretty good frakkin’ television along the way. There’s enough sentimental peeks into a familiar world that we already know—so that’s how Bill Adama gained that sense of honor!—but enough new compelling characters to keep us coming back for more than just nostalgia. I, for one, plan to tune in to see what happens. Good hunting, Caprica. See you next year! Previous PostHiFi-SciFi: Battlestar Galactica/Caprica Paley Festival PanelNext PostTrekking to Outer Space… And Beyond! Great to have you! We love followers!